Rows upon rows of concrete poles are neatly arrayed along a hillside in Miluo Township. Beside the poles stand kiwi trees, about 2 meters tall, whose branches spread out along a wire net knitted at the top of the poles, giving the scene the resemblance of a vineyard. The kiwi orchard in Miluo in Shuicheng County, in Liupanshui in southwest China's Guizhou Province, is also a poverty alleviation project. Green, egg-sized, oval kiwifruits hide beneath dense leaves, escaping the attention of unskilled eyes. "Here they are," said Xie Mengjie, Deputy Secretary of the Miluo Township Committee of the Communist Party of China (CPC), pointing at two kiwifruits that he had spotted. As kiwifruits mature in summer, by September, most of those in the orchard have already been harvested, he said. Miluo has 34,566 residents in five villages, half of whom belong to minority ethnic groups. Currently, nearly one fourth of all the residents still live in poverty. In recent years, some residents have shaken off poverty by working in the kiwi orchard. Wang Shunyou, a resident in Ejia Village, used to plant corn and yam, making only around 2,500 yuan ($382) a year. With a 70-plus-year-old mother and two school-age children to support, he had to work odd jobs elsewhere. After the kiwi orchard was developed, he started working there. Gradually, he became a skilled worker and then a supervisor, making 36,000 yuan ($5,500) a year. In 2016, he received nearly 100,000 yuan ($15,280) from the project's management company, which in addition to his salary included. dividends from the land he invested in the company in return for shares. With the money, he bought a car. "Although it took painstaking efforts to pool land together, now seeing the stretches of kiwi and walnut trees and scores of people working there every day, I feel relieved," said Zhang Dingrong, Secretary of the CPC Branch of Ejia Village. In 2015, Ejia was removed from the list of poor villages in the county. In the breeze. Wave after wave of rooster calls break the tranquility of the valley. The location is the Liangdufeng Chicken Farm, launched in Qinglin Township in February to alleviate poverty in the area. Currently, around 10,000 chickens live on the farm, while approximately 10,000 chickens have been sold to customers including supermarkets, schools, hospitals and government departments, said Zhao Zerong, Manager of Zhongshan District Property Management and Service Co. Ltd., a state-owned company founded to run government-funded poverty alleviation projects. Zhao said the site used to be a waste dump before the company carried out ecological restoration and built the chicken farm. Technology support for the farm is provided by Liu Huagui, a researcher with the Chinese Academy of Agricultural Sciences. "I searched for information about chicken feeding online, and I found Liu," Zhao said. He then called Liu to request help, and Liu agreed. 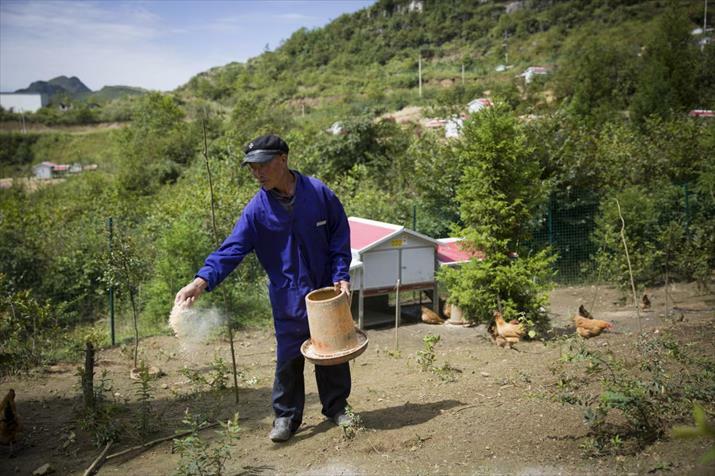 Lu Fengjun, an impoverished resident in Haifa Village, makes 60 yuan ($9.15) per day working at the farm. That salary is the major source of income for Lu's family, which also receives around 3,000 yuan ($458) per year for leasing land to the farm. Farmers are encouraged to invest their land, money and labor in the farm in return for dividends, rental income and salary, Zhao said. It is expected that the entire project will lift 800 people in 200-plus households out of poverty, according to the Liupanshui Bureau of Poverty Alleviation and Development. "My wife and I were both injured in a traffic accident while riding a motorcycle," Lu said. That happened when the couple were working in Shuicheng. Lu was partially crippled in the accident, while his wife, Zhang Caimei, was disabled and lost the ability to work. The couple have three school-age children and live with two of their parents. The family of seven had fallen into destitution. But since Lu started working in the chicken farm, their conditions have improved. Luobie Township in Liupanshui administers 13 villages. The villages have a total population of 40,800, 54.18 percent of whom belong to minority ethnic groups, and 9.18 percent of whom live in poverty, according to statistics from the township government. Most impoverished families are heavily indebted for their children's education or have members with disease or disability. As a targeted poverty alleviation campaign is sweeping across Guizhou and the nation in general, Luobie, though remotely located in mountains, has not been left out. The township has started various poverty alleviation initiatives from large-scale planting of tea and fruits such as cherries and kiwi to husbandry of pigs and chickens as well as apiculture and aquaculture. These projects have provided employment for impoverished locals and increased their incomes. Moreover, banking on its stunningly beautiful scenery, pleasantly cool weather and colorful minority culture, the township is actively developing tourism. Lodging and catering facilities including hot spring spas and resort villas have been built along a river. For example, Niujiao Village boasts of an exquisitely designed wetland park featuring a wide variety of flowers and water plants as well as a museum showcasing the culture of the local Bouyei ethnic group. Tourism development and infrastructure construction have provided 675 impoverished people with jobs, increasing their average monthly per-capita income by over 3,800 yuan ($580), according to the township government. During the 13th Five-Year Plan (2016-20) period, Guizhou plans to move 2.05 million, or around 40 percent of all of its 4.93 million poor people, out of poverty through the development of various industries. 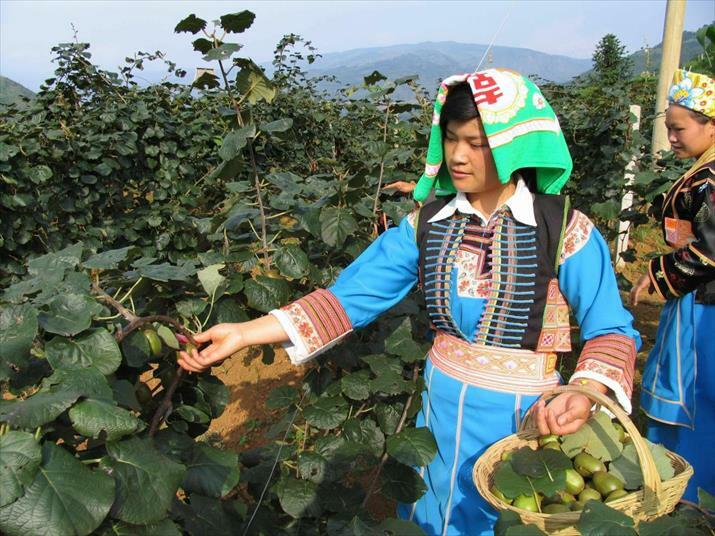 Guizhou's poverty elimination efforts emphasize the production of specialty agricultural products such as medicinal herbs, tea, vegetables, nuts, potatoes and oil-bearing crops, as well as the development of rural tourism and restoration of ecosystems, according to the Guizhou Poverty Alleviation and Development Office. Data from the office show that in 2016 alone, the province launched more than 20,000 related projects, while 742,000 people became affluent by engaging in production of high value-added products.